Lightweight and maneuverable. 27" sweeping path, adjustable pressure main broom and side broom and 1.4 cubic feet (40 liters) hopper capacity. Up to 31,000 square feet per hour sweeping area. When pushing the sweeper, the larger rear wheels activate the brushes to sweep debris into the hopper. Click here to view more sweepers. With dual main brooms, dual side brooms, and a 26 inch wide sweeping path, the Terra® 26M manual sweeper offers outstanding sweeping performance, picking up debris from fine sand to larger trash such as crumpled paper and plastic beverage bottles. 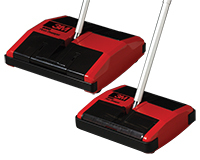 Dual side brooms sweep clearly alongside baseboards and curbs, providing a clean sweep path. The fast and efficient Terra 26M (Average Productivity is rated at 28,600 sq. ft./hr) is much more productive and effective, than standard push broom sweeping. 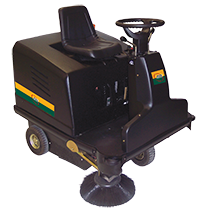 The ideal machine for large area sweeping, the Manta RS 36 can cover 66,731 square feet per hour. This unit will work equally well on hard floors and carpet, indoor or out. 27.5" main broom with 15.4" side broom. Two 12V batteries provide four to five hours of run time. Flip top battery lid allows easy access to internal components. 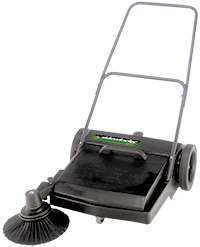 Heavy-duty, 1-HP drive motor allows unit to reach 3.5-mph. Includes high-frequency, onboard battery charger. 4500 is 9.5"x8.5". 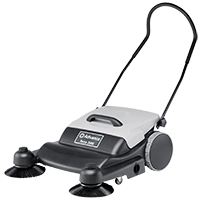 6000 is a 12.75"x11.75" heavy-duty sweeper. Both are made from ABS plastic and are safe for hard or carpeted surfaces with rubber rotor blades that are replaceable and washable. Debris bins (two for each) lift out for easy emptying.